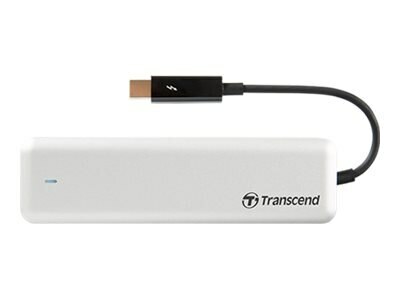 Transcend's 480GB JetDrive 855 Thunderbolt 10 Gb/s External Solid State Drive Upgrade Kit combines a JetDrive 850 PCIe Solid State Drive with a sleek aluminum Thunderbolt enclosure to instantly revitalize your Thunderbolt-equipped MacBook Pro, MacBook Air, Mac mini, or Mac Pro. Featuring a 10Gb/s Thunderbolt interface, capable of blazing-fast file transfers, this drive is designed to tastefully complement your Mac's simple, clean lines. In addition, the inner solid state drive is removable for more versatile use based on your preferences. This drive allows you to increase storage capacity, ensuring you have plenty of space for your documents, photos, music and videos.